It is studied the adsorption of endotoxin on the carbonized materials as rice shell and apricot stone. Effect of carbonation temperature on a specific surface and porosity of these materials has shown. Efficiency of lipopolysaccharide adsorption on carbonized rice shell has been established. Modification of the surface of rice shell by polyethyleneimine solution decreases value of adsorption on the surface of rice shell. Endotoxin removal from biological solution represents a global problem today. Because of endotoxin toxicity, the removal of even minute amounts is essential for safe parenteral administration of drugs and also for septic shock patients’ care . Gram-negative sepsis, a relatively rare clinical diagnosis only a few decades ago is perhaps the most important infectious disease problem in hospitals today. Despite recent advances in our understanding of the pathophysiological mechanisms of sepsis and improved antimicrobial therapy, the mortality rate from gram-negative sepsis remains frustratingly high, particularly after the onset of shock [2; 3]. One of the most promising methods by adsorption and removal endotoxin is development of endotoxin elimination technology by carbonized adsorbents obtained from plant raw material. Clarification of endotoxin and adsorbent interaction is most important . There are some inform about interaction of endotoxin with cation adsorbent in the literature. Established, that lipopolysaccharides interactions with cation polymers by electrostatic bind between the negative charge group of endotoxin and positive charge groups of polymer [5; 6]. Also, they can have hydrophobic interactions in those complexes . LPS adsorption on the sorbents obtained from plant raw material can has not covalent interactions. Besides, sorption activity of sorbents can be adjusted by change of their specific surface. The aim of this study was research of LPS adsorption on carboneous rice shell and apricot stone. The lipopolysaccharide (LPS) used in this study was derived from Escherichia coli isolate 0111:B4. The powder samples purchased from Sigma Co. were resuspended (1µg/mL) in 30 ml of sterile 0.2 M phosphate-buffered saline at pH 7.3 and stored at ?80°C. The initial concentration used in adsorption experiments was 1.0 ng/mL. We used a commercially available LAL-based kit QCL-1000® from Lonza Co. The method utilizes the initial part of the LAL endotoxin reaction to activate an enzyme which in turn releases p-nitroaniline (pNA) from a synthetic substrate, producing yellow colour. Measurements of IR-spectra of researched samples have been carried out on IR-spectrometer UR-20 from “Mattson” (USA) with Fourier transform as the tablets pressed with KBr . We used sorbents as rice shells (RS) and apricot stones (AK), activated at different temperatures served as main raw material for the adsorbent’s preparation, received from Combustion Problems Institute of al-Farabi Kazakh National University. 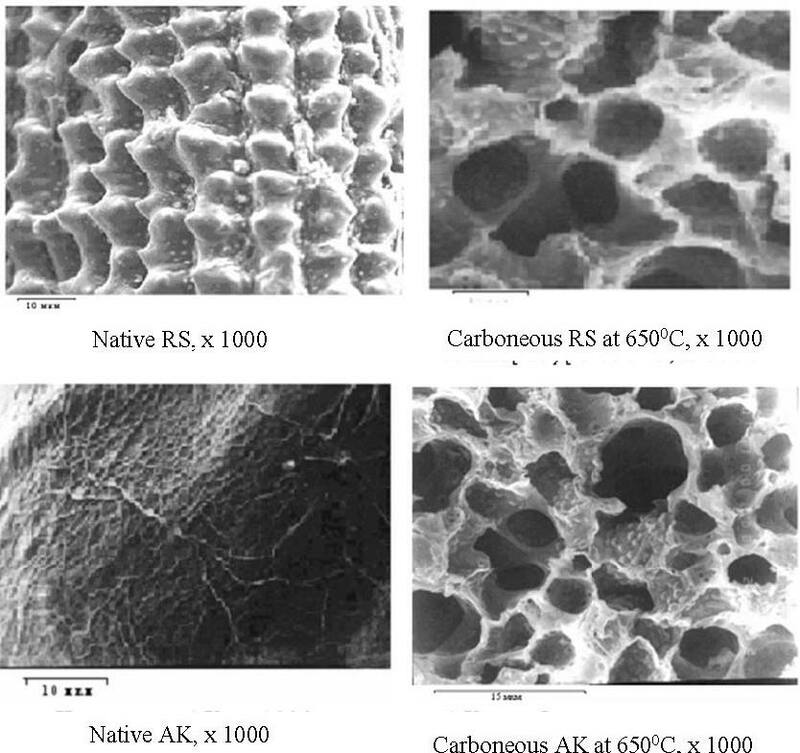 A specific surface of carboneous adsorbents has studied by argon thermal desorption method . We used 1 g sorbent materials for experiment. It was used different concentrations of polyethylenimine (PEI) for surface modification; molecular weight of PEI was 1.10-4 (from A.V.Topchiev Institute of petrochemical synthesis of the Russian Academy of Sciences). RS was in PEI solution 1 day for surface modification. We used different concentration of PEI like 1.10-3M; 2,5. 10-3M; 0,5.10-4M mole per liter. Kinetic adsorption of LPS on RS and AK from phosphate buffer solution has shown that both materials are effective sorbents (Figure 1). Obviously, that adsorption on rice shell demonstrate that most of LPS was eliminated from the solution within the first 20 minutes, and adsorption on apricot stone demonstrate maximal adsorption of LPS only on 60 minute. Probably, we cannot to say about surface layer saturation, because of initial concentration of LPS was nanogram in the solution. Therefore, determinate of time process enables to compare efficiency adsorption on different adsorbents. The both studied materials showed also very high adsorption capacity in respect of pure solutions of endotoxins. This is possibly governed by relatively higher specific area of the rice shells (Table 1). From table 1 specific area of rice shell has relatively higher as compared to those of apricot stones. RS and AK have maximal surface area as 910 and 830 m2/g at 6500С. Consequently, porosity of materials accordingly changes. Therefore we used sorbents which carbonized at 6500С. Figure 2. shows that carbonization process increases porosity of materials and high adsorption capacity. Carbonization would create a different pore system and therefore it would change the properties of the activated carbon. This tendency also is more expressed for RS. For finding-out of possible mechanisms of interaction LPS and rice shell we researched IR-specter of samples (Figure 3). LPS spectrum has shown the intensive absorption band (3435,1 cm-1), it is correspond to valent fluctuations of О-Н and N-H bind. Besides it has low peaks on 1638,8 cm-1, 1462,8 cm-1, they are deformation fluctuations of hydroxide, imine, methyl and methylene groups. IR-spectrum of RS has absorption band with the low intensity, corresponding NH, -C-OH, =C=O to groups, and also the high peak corresponding -С?С- binds. On the basis of these data, it is possible to assume H-binds between ОН- groups of LPS and RS. In a solution it is possible also protoned NH-groups of LPS and RS with protons of water that can serve as the reason of occurrence of electrostatic contacts between amine and anionic groups. The combination oligosaccharide and lipid parts in molecule LPS proposes formation hydrogen and hydrogen bonds. For finding-out of a question on an opportunity of occurrence of electrostatic contacts between LPS and RS carried out sorption of endotoxin on RS which modified cationic polyelectrolyte – polyethyleneimine. 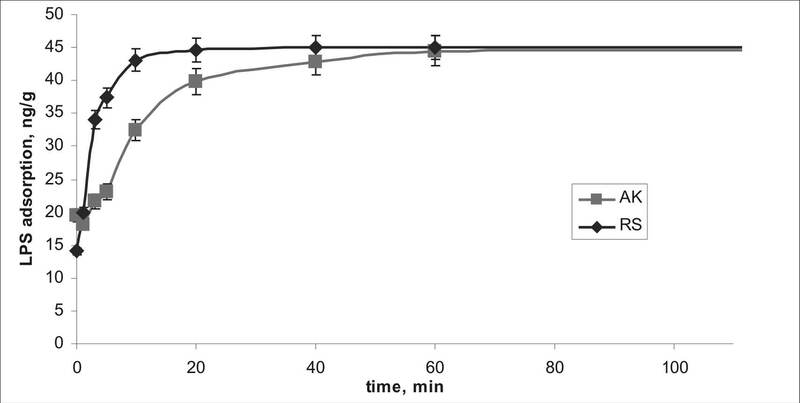 Figure 4 shows that sorption of LPS on the unmodified sorbent goes much more intensively, rather than on the samples modified with polymer. In this case it is difficult to deny an opportunity of electrostatic contacts when it is available the functional groups having an opposite charge. The reason of decrease of effective sorption on modified adsorbents can be, that polymer closes adsorption sites on a surface of a sorbent. As shown in works , carbonized raw materials formations nanostructures on surfaces of the material, providing high specific surface of a material and, accordingly, good sorption characteristics. It is known , that adsorption of polymers on a surface of materials results formation on them of a layer thickness of 10-40 nanometers. It is uneasy to assume, that such layers can smooth completely a roughness of a surface and close time that results in sharp decrease sorption activity of materials. Summarizing, the present work described the adsorption process using carboneous materials samples for the removal of endotoxins, which unmodified adsorbent showed good adsorption properties for LPS. Modification of the surface apparently has not affected LPS binding to the adsorbent’s surface. 1. Petsch D., Anspach F.B., J. Biotechnol. 2000. V. 76, P. 97. 2. Anderson W.B., Huck P.M., Dixon D.G. & Mayfield C.I., Appl Environ Microbiol. 2003a. V. 69. P. 3002. 3. Bemberis I., Hirayama C., Kunitake M., Nakayama M., Sakata M., Todokoro M. & Yamaguchi Y., BioPharm International. 2005, V. 18, № 1. P. 50. 4. Anderson W.B., Mayfield C.I., Dixon D.G. & Huck P.M., Water Res. 2003b. V. 37. P. 4553. 5. Moore R.A., Bates N.C., Hancock R.E.W., Antimicrob. Agents Chemoter. 1986. V. 29. P. 496. 6. Brandenburg K., Koch M.H.J., Seydel U., Eur. J. Biochem. 1988. V. 258. P. 686. 7. Ohno N., Morrison D.C., J. Biol. Chem. 1989. V. 264. P. 4434. 8. Cazitsina L.A., Kupletskaya N.B. 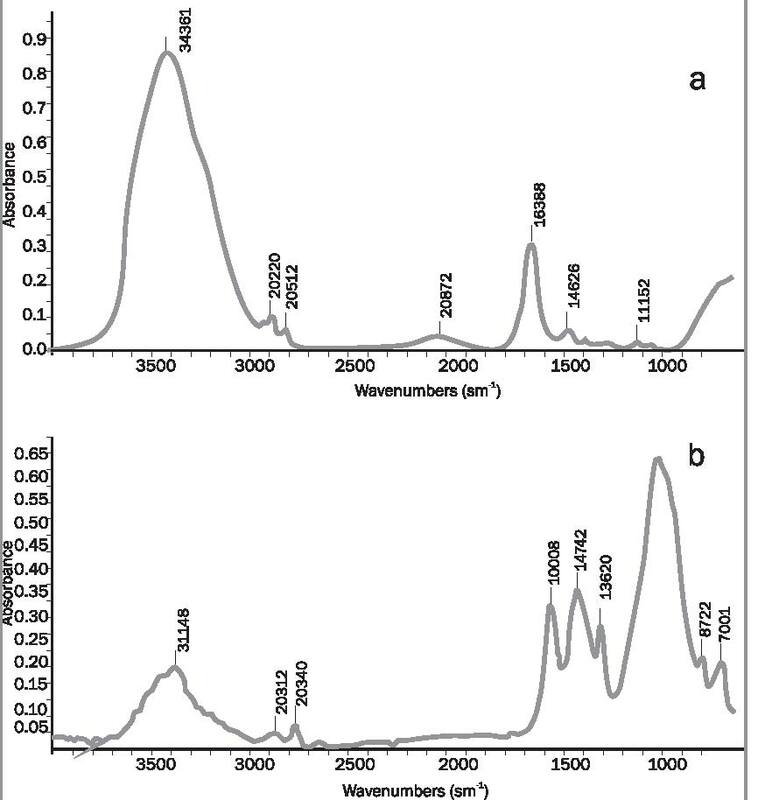 Using of Ultraviolet, NMR and mass-spectrometry in organic chemistry – М.: МSU. 1979. P. 61-87. 9. Gregg S.J., Sing K.S.W. Adsorption, surface area and porosit. s.l. : Academic Press, 1982. P. 259. 10. Mansurov Z.A, Zhylybaeva N.K, Ualieva P.S, & Mansurova R.M., Chem Sust Dev. 2002. V. 10. P. 321.